Gunmen have attacked two mosques of the minority Ahmadi Islamic sect in the Pakistani city of Lahore, killing dozens, officials say. Saleem Ulhaq Khan was inside one of the mosques, in the Model Town area. He describes what happened. They started firing and bombing indiscriminately. Everyone started rushing around in panic. There's a security gate - that got closed. People were running trying to find a place to hide. I saw one of the attackers as he was entering the sermon hall, then I ran away. He very much reminded me of the people who attacked the Sri Lankan cricket team, he was wearing similar clothes - the traditional Pakistani dress shalwar kameez and he looked like someone from a tribal area. "I was too scared to leave, even after the firing had stopped"
I went upstairs and I found a room with a bed, I hid under the bed. I was too scared to leave, even after the firing had stopped. I saw from the window security personnel, rescue people, fire brigade. The bodies had already been taken away. This is a big old building, it's 50 years old. I was on my own. I didn't know what was happening. I could hear the firing going on for quite some time. I am not surprised by this attack. We were expecting it for three or four weeks - a threat was published in a local newspaper that there would be attacks and the authorities were informed. That's why we have our own security guards in front of our mosques. They are not professional, they are volunteers. They were the first to have been killed. These are innocent people; we are a peaceful community. Our activities are prohibited by law and we are officially targeted. This is wrong. I blame the fundamentalists, but I also blame the authorities. We are peaceful, law-abiding citizens and we get no protection. I want the world to see how we've been treated. Terror revisited Pakistan's cultural city, Lahore, when Taliban militants simultaneously attacked twin-mosques of minority religious sect during Friday prayers, that left at least 70 people dead and more than 90 injured. The brazen attacks on mosques were carried out in Lahore's Model Town and Ghari Shahu areas just after prayers when most of the worshippers were inside the mosques. Both mosques belong to the Ahmadi (Qadiani) sect. 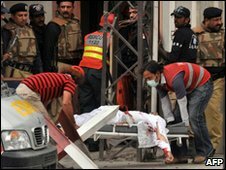 More than 70 people were killed in the attacks, according to Sajjad Bhutta, the district administrator of Lahore. Hospital officials spoke of dozens of people who were injured. At Lahore's Jinnah Hospital, where many of the bodies were brought, doctors were treating 47 wounded, and 17 were in critical condition, Dr Javed Akram, the hospital's chief executive, said. He feared that the death toll could rise. The attackers were armed with AK-47 rifles, shotguns, grenades and other explosive devices. "Terrorists entered into the mosques through main gates, clearing their way through gunfire and hurling grenades," said Khusro Pervez, Lahore's commissioner. On Fridays, about 1,500 to 2,000 people attend prayers at each mosque, according to Munawar Shahid, an Ahmedi community official. In Ghari Shahu, some terrorists were holed up inside the building while others took up positions on the Mosque's rooftop and minarets, firing on security officials trying to enter the building. The snipers were cross firing who had taken positions on adjacent buildings. Six blasts were heard inside the mosque while heavy exchange of gunfire continued for nearly three hours, said Chaudhary Ishaq, an eyewitness. Police officials and elite forces took control of the Model Town mosque an hour before the security forces eliminated terrorists in Ghari Shahu mosque. There were four attackers involved in the model town attack out of which two managed to climb over the wall of the worship place and started throwing grenades, while the other two opened fire outside, an official of the elite police told media. Initial reports indicated that two of the attackers have been arrested, while one has been killed and one might have managed to escape. A person claiming to represent the "Punjabi chapter" of the Pakistan Taliban, formally known as the Tehrik-e-Taliban, said the group was behind the attack, according the private Geo TV station. The attacks on minority communities were expected as banners of hatred against minorities were displayed in several parts of Lahore on Thursday. One of the anonymous banner in Ghari Shahu area read "Jews Christians and Ahmedis are the enemies of Islam." The Ahmadi sect was founded by Mirza Ghulam Ahmad in 1989. His followers believe that Ahmad was a prophet and that the institution of prophet-hood will continue till doomsday. While the Ahmadis consider themselves Muslim and follow all Islamic rituals, they were declared non-Muslim by Pakistan's constitution in 1974, and in 1984 they were legally prohibited from calling themselves Muslims or reciting Islamic prayers. Around four million Ahmadis live in Pakistan. The group has in the past been targeted by radical Sunni groups - who consider the Ahmadis as "Kafirs". Members of the community have often been mobbed, or gunned down in targeted attacks. But this is the first time their places of worship have suffered daring and well-coordinated attacks that bear the mark of Taliban militants. Muslim fundamentalists used to be highly thought of when they were killing westerners. Not so hot now are they ? By fundamentalists i take you meant Extremists. The extremists come from the fundamentalists who say things like "they shouldnt have done it but I can understand why they did it" and now after breeding and educating fundamentalism they are paying the price. erm, who educated the fundamentalist and who's paying the price? Pakistan is the home of Muslim fundamentalist schools. In particular ? Muslims .